Barbara Jwanouskos chats up Jerome Gentes about creating new musicals and singing your heart out. You don’t often hear about new musicals being developed – or at least, I don’t, which is why I was super excited when I met Jerome Gentes to learn about Musical Café – a development program for musicals written by Northern California creative teams. The process for creating and developing a new musical, however, is a lot of work and brings a lot of artists together from highly talented writers, lyricists, composers, actors, singers, and musicians – what is required to put on a good musical is a lot of dedicated, focused hard work. Jerome and I had a chance to chat about Musical Café and new musicals in the Bay Area. Here is a little taste to get you ready for Musical Café’s Spring Showcase this Sunday. Barbara: Tell me about Musical Cafe — what do you do and how did it start? Jerome: Musical Cafe is a quarterly concert recital showcase of new musical theater works-in-progress. This Sunday’s showcase is the second of four we’re doing this year. With the showcases, we offer a chance for Northern California writers and composers to present new musical works in the making. Because there are typically fewer opportunities to develop new musicals as opposed to straight plays, we wanted to create a chance for new work to be seen and heard. There were a lot of people quietly working on new musicals around the Bay Area, and the platform we wanted for ourselves is something we realized could be helpful for others. And it’s astonishing how many of us are here in the Bay Area. Not all new musicals come from New York! The core group came originally came together because of Anne Nygren Doherty and Not Quite Opera/New Musical theater of San Francisco. She had a wonderful series called Round One Cabaret, and later pulled a group of us together back in late 2012 to build a show. After we did one, some of us wanted to try it again. In the time it took us to really get going on another show, other collaborations and projects formed along the way. Eventually one of the composers suggested we try to create our own showcase presentation of the various projects we were all working on, including the group show. Through Sandy Kasten, we had a connection to Play Cafe, and with its help and support, and the help of a generous grant from the Sam Mazza Foundation, that evolved into Musical Cafe. We’re entirely volunteer-run, and have only come this far with a lot of help and support from people who love new musicals as much as we do. Barbara: What is your background in theater? Jerome: Sandy was an actor when she was young. Recently she’s studied musical theater and lyric writing at the Academy for New Musical theater in Los Angeles. 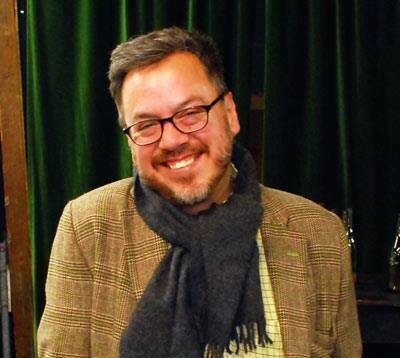 Richard Jennings, one of the other key production team members, has been composing for years, from music for various regional theaters and dozens of Shakespeare productions to musicals for adults and kids. I did the usual let’s-put-on-a-show stuff when I was young, then wasn’t involved in theater for many years except as an audience member. In college I dabbled in playwriting, and read a lot of published plays. And in grad school I attended many of the developmental readings of my friends in the theater department and saw a lot of theater. An improv class about five years ago really reignited my engagement in theater, and since moving to the Bay Area in 2011, it’s been almost nothing but, from acting bits to lots of writing and now this. Barbara: As someone developing a new musical, what does Musical Cafe offer? Jerome: As we see it, the key thing that we offer is a platform for creatives to present book material as well as musical material in a concert recital formal. Musicals are often development-intensive, and the process can be long. We wanted to offer a chance to present parts of work that’s still in development–some of our shows are necessarily fully drafted–to a live and appreciate audience. 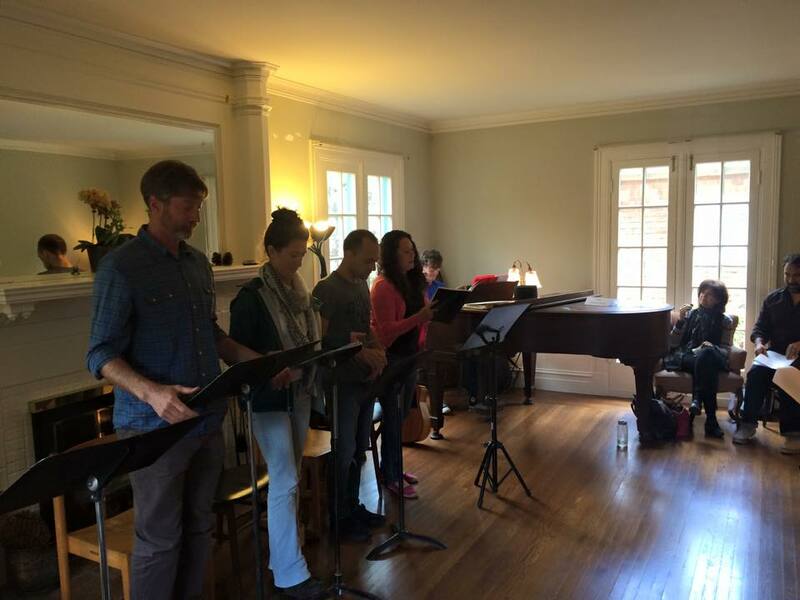 Musical Cafe also offers connection to and community with others involved in the creation of new musical theater works–writers, composers, directors, actors, musicians. If anyone’s interested, the submission period for our summer Showcase, which will rotate back to the East Bay, is open until May 15th. More info is available at playcafe.org. And we’re planning to be back in SF in October. Barbara: What might we expect at the Musical Cafe Spring Showcase? Jerome: Great singing and acting, for one thing! Each team presents a twenty-minute section of work. With the help of our volunteer submission committee, who vetted all the submissions we received this past winter, we gradually shaped a program of selected songs and scenes from four new musicals that explore a wide range of subjects and themes–from adolescent angst to the discovery of creative passion to adaptations of classic literature. From piece to piece, the music spans a variety of styles.We encourage each creative team to present material from the entire play, so the various songs and scenes you’ll hear might be opening numbers, “I-want” songs, transitional dramatic material, and so on. And of course, there’s fantastic singing and acting! Each team casts its own presentation, but teams sometimes share actors. We also have a talented musical director, Phil Surtees, who provides the piano accompaniment during rehearsals and at the show. He’s even playing the guitar in one number. And did I say great singing? Barbara: What has been the most surprising musical production here in the Bay Area in the last few years? Jerome: I enjoyed the recent musical takes on Wozzeck and Twelfth Night at Shotgun very much, and Triassic Parq was a fun, crazy romp. Richard enjoyed 100 Days, which I unfortunately missed. I just saw a production of Jesus Christ Superstar, of all things, at Stage 1 down in Newark that had some of the most spectacular young voices I’ve ever heard. But the piece I keep mulling over the most is An Evening with Meow Meow. I loved its deceptively familiar start as a traditional cabaret, and how Meow Meow began deconstructing the show and even her own persona, going further and farther into the meta-ness and the deconstruction while still expanding and evolving the piece and her character at the same time. Barbara: Do you have any thoughts or advice for those starting out and wanting to write music, lyrics, or the book for a new musical? Are there any special considerations? Jerome: Sandy encourages beginners to see a lot of musicals, and different performances of the same show. And to learn their craft. To that I’d add testing your craft as you are learning, and staying committed to exploring different kinds of music and theater and musical theater, from the most traditional to the most non-. Richard says that you must be willing to find opportunities to see your work performed by different players so you can test how strong the material really is. And that you must be willing to rewrite and to enjoy the creative process. In all it’s ups and downs. Above all, the three of us enjoy the experience of musical theater–theater, period–as a collaborative creative form and collaborative creative process. Good collaborators are essential. Great collaborators are a gift, a treasure. And certainly a project like Musical Cafe can only be done as that kind of team. Musical Café’s Spring Showcase will be held this Sunday, May 3rd at Stage Werks Theatre at 446 Valencia Street in San Francisco where you can hear four new musicals in development. Submissions for their Summer Showcase are open until May 15th. For more details: http://playcafe.org/2015/01/25/call-for-submissions-to-musical-cafe-showcase/.